Just ask true believer Larry Steele, an Oregon State University Extension Service master gardener who commends the rich nutrition of red-worm manure, also known as castings. Right away he learned the most important lesson in vermicomposting: Don’t use the big worms already wiggling around in the soil. These big night crawlers won’t hang around. Instead, keep your worm farm working with red worms, also called red wigglers or tiger worms. Build or buy the worms a box or bin, feed them food scraps and they’ll reward you by sticking around and producing a rich compost that not only adds nutrients to the soil, but also improves its structure. 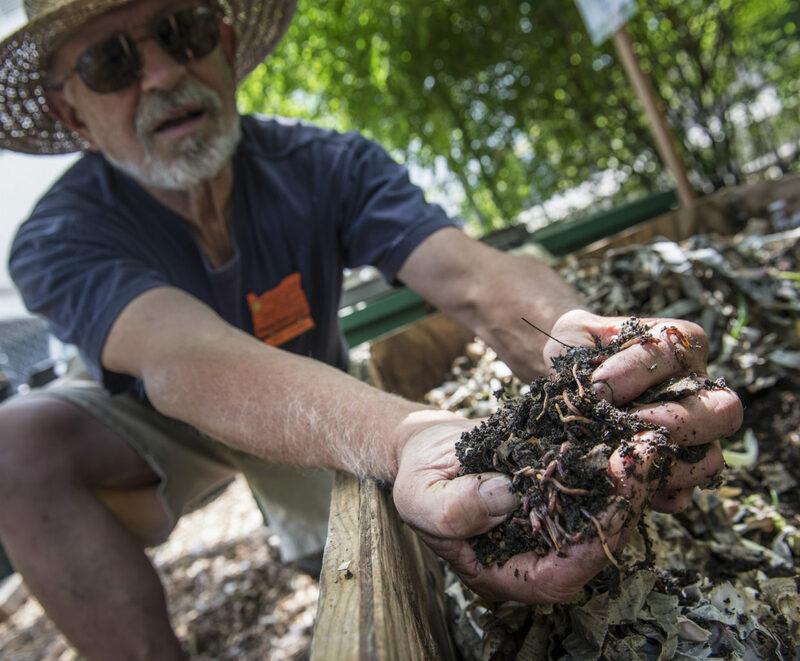 “If you build a comfortable place for them to live and keep feeding them, they’ll never go away,” said Steele, who keeps a worm bin at home and at the Linn County Master Garden Demonstration Garden in Albany. Making a comfortable place for the worms is an easy enough proposition. Plenty of worm bins are on the market, but building one takes only six pieces of plywood, a hammer and some nails. Make a box by attaching sides and bottom, but leave the top board loose so you can open and close the bin. Add hinges if you’re feeling ambitious. Don’t forget to drill holes in the sides of the box to give the inhabitants air; they’ll die without it. The size of the box depends on the amount of food waste you add during a week. A good rule of thumb is a square foot of box per pound of waste a week, according to Steele. A 2-by-4-foot box with a 12- to 16-inch depth is a good place to start. Plastic bins can be used, also, but because of their nonporous nature you’ll need two bins stacked on top of each other with spacers (bricks would work) between them. In this case, drill holes in the bottom of the first bin so liquid resulting from the vermicomposting process can drip down. The liquid can be mixed with water and applied around plants. Wooden boxes can be set on bricks with a tray underneath to catch liquid, but in Steele’s experience it hasn’t been necessary. For bedding, newsprint is a cheap and easy option, but only use the black-and-white sections. Tear it into long strips, soak it in water and squeeze until it’s about as moist as a damp sponge. Fluff it up and then fill the bottom quarter of the box. Add worms and cover them with a layer two to three times as thick as the bottom layer. Lay down more bedding when it is reduced by half, about every month or two depending on the size of the bin and how much food is provided. Steele recommends about 1,000 worms for that size box, but even a quarter of that amount will work. “They have a marvelous capacity to reproduce,” he said. “Eight mature worms can result in 1,500 offspring in six months.” No need to worry about worms crawling out of the bin, though. The size of the box and amount of food will keep them in check. Red worms are available at places that sell fish bait and online from outfits that supply vermicomposting equipment. Or, scoop out a handful from a friend’s bin for free. Again, be sure to get red worms, not night crawlers. To feed the worms, just pull back a bit of bedding, put in some kitchen or vegetable garden waste and cover it up. Worms are top feeders, Steele explained, so they’ll naturally come to the uppermost layers to eat. As they digest the food, it passes through and comes out as castings or, to be more precise, worm manure. Feed the worms vegetable and fruit scraps, banana peels, coffee grounds and filters, tea bags, crushed egg shells and corn cobs. Don’t add meat, fish, bones, oils and dairy products. Be conservative with citrus peels, onions and garlic. You can chop up the bigger pieces or not; eventually they’ll get eaten. Letting the scraps sit in a bucket outside to rot a little isn’t a bad idea, Steele said. Worms go through softer things quicker. The best location for a worm bin is in a garage or shed, but they can be kept outside year round if filled with enough bedding for insulation. Watch the moisture level, too. In summer, you may need to sprinkle it down to keep it damp enough. As the castings build up in the bottom of the bin, harvest by pushing aside the bedding and scooping out a double handful of finished product. Take as few worms as possible in order to keep your worm farm populated. Put the castings on a table in the sun for about 10 minutes. Since the worms don’t like sunlight, they’ll retire to the inside of the mound of castings. Just gather them up and add them back to the bin. If that seems too tedious, skip that step but you’ll be losing a lot of worms. The castings can be added to regular compost – about 25 percent – and used to build up beds. Or spread them around plants and dig in slightly. Sprinkle castings on potted plants and over garden beds. A little goes a long way. Other uses include adding to the bottom of planting holes and mixing with potting soil at a concentration of about 20 percent. For more information, check out Extension’s publication on Composting with Worms.